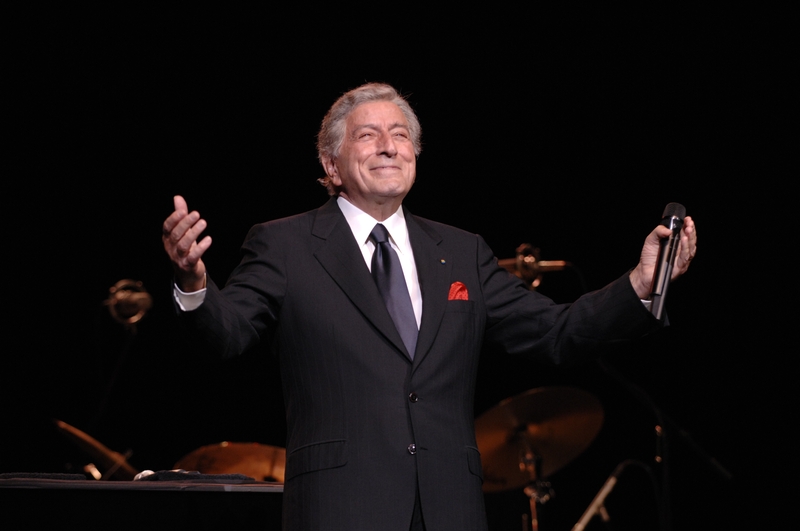 “We’ll have what he’s having” was undoubtedly what was going through the minds of the adoring punters who packed out the Concert Hall on Tuesday night to witness living legend Tony Bennett strut his singing stuff at the age of 88. Anyone who didn’t hear him on the same stage two years ago might have expected that this concert would be one of those senior citizen specials in which much of the applause after each song is actually a reward for making it through to the end without keeling over. 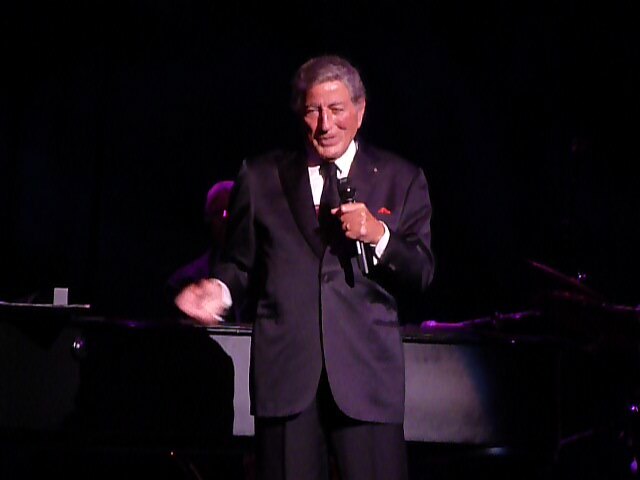 With Tony Bennett, the standing ovations that routinely followed his often energetic – the Tony twirl is undoubtedly his signature move – performances were purely down to the extraordinary affection that the audience has for him and the fact that he is still singing wonderfully. Of course, great care has been taken in the way the programme (almost identical to 2012’s) has been constructed, and Bennett is adept at pacing himself. On songs, such as Maybe Next Time, which are going to have a big, belted-out finale (and boy, can Bennett still belt them out), he holds back for most of the number before socking it to his stunned listeners. Dazzling as those grand finales were; on Tuesday it was the quieter, more intimate songs which were the most memorable; in particular Once Upon a Time, a ballad which is perfect and poignant for a singer of his age to be performing, and one which highlighted the fact that he is a poet with song: his reverence for the lyrics – the words and their meaning – enable him to paint a picture and tell a story in a way that many singers fail miserably to do. The last time Tony Bennett performed in Glasgow, two years ago, he was already well into his eighties but, over the course of a non-stop 75 minute performance, he positively romped through a programme of no fewer than 26 songs, without pausing for anything more than the briefest chat and acknowledgement of the massive outpouring of affection for him from the packed Concert Hall. The longer he was onstage, and the more he sang, the more animated he became – and it seemed that the enthusiastic response from the audience was fuelling his staggeringly lively performance. And it’s not just to his audience that Bennett feels a sense of responsibility; as the oldest popular singer on the block – and the one whose career stretches back over an incredible six decades – he regards himself as a custodian of the Great American Songbook. After all, there can only be a handful of singers still around who have direct links with the original contributors to that body of work, and such original exponents of it as Bennett’s hero, Fred Astaire. Does Bennett feel a sense of responsibility to these songs? Bennett first heard many of them – including the one he cites as his personal favourite, Jerome Kern’s All The Things You Are (“I just adore that song”) – as a youngster growing up in the Queens borough of New York. Before he discovered this homegrown American music, however, it was his father’s Caruso records which introduced him to the art of singing, and in particular to the “bel canto” style, which explains his graceful way with a song and his elegant phrasing. Bennett may be embarrassed about that episode but it was exceptional, since he was an active supporter of and participant in the civil rights movement in the 1960s, responding to the call to arms from his friends Martin Luther King and Harry Belafonte. 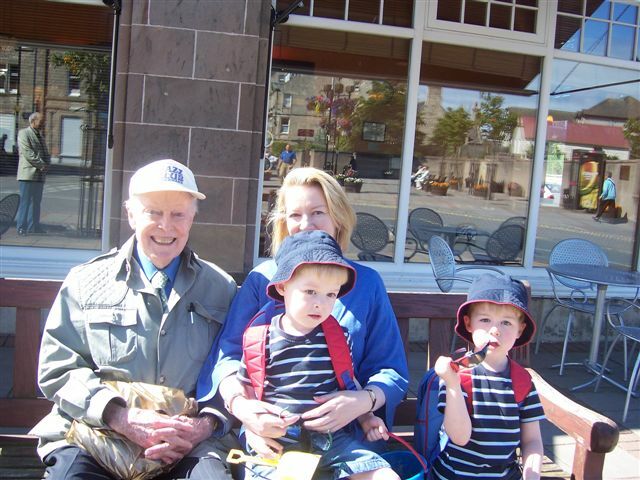 His own life hadn’t been without struggle, and the other overwhelmingly striking thing about a conversation with him is how lucky he feels to have had the life he’s had, making a living doing something he loves, and how – even now, nearly 60 years after his initial success – he still counts his blessings. Rodgers & Hart Songbook with the Ruby Braff/George Barnes Quartet; intimate, cult recordings which are among the very best vocal works in all jazz and which highlight Bennett’s admiration and respect for the some of the most eloquent lyrics in the Great American Songbook..
Relaunching his career in the late 1980s, performing on MTV, and duetting with young pop stars – most recently Lady Gaga – has brought him to new audiences. But best of all, his later success has allowed him to be exactly the kind of singer he wants to be – singing jazz with his quartet and creating an intimate atmosphere even in the largest venue. “I like working that way,” he says. “To clarify my whole premise: I don’t want to be the biggest. I’d rather be one of the best.” Mission accomplished, I reckon. 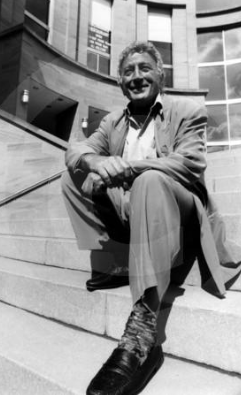 * Tony Bennett performs at the Glasgow Royal Concert Hall on Tuesday, September 9th. He may have managed to do a post-prandial walkabout through the city centre yesterday afternoon without being accosted by anyone other than your reviewer, but Tony Bennett was welcomed to the Concert Hall like a long lost brother when he came onstage last night. Anticipation had been building for the opening 20 minutes of the concert, which had been taken up by his daughter Antonia, a singer with a more stagey style than her jazz-influenced father who still has a thing or two to teach her about phrasing and conveying the meaning of lyrics. He may be in his third decade of pension-drawing but Bennett positively romped through his repertoire, dishing up one greatest hit after another in a continuous programme that comprised a staggering 26 songs. As seems often to be the case with these “senior” stars, the longer he was onstage, the more alive, animated and energetic he became. It was as if the warmth which poured forth from the audience fuelled the performance. Accompanied by a quartet which featured guitarist Gray Sargent – whose duets with Bennett at the start of such sublime ballads as But Beautiful (the Billie Holiday version of which had been playing in Rogano while Bennett lunched) were highlights – the 85-year-old singer displayed an astonishing power and command. Indeed, for his final encore, to convey how moved he was by the massive wave of affection from the full house, Bennett put down the microphone and, accompanied by Sargent, sang Fly Me to the Moon as he swivelled gently round, taking in every section of the audience and imploring them with his hands as he sang “Fill my heart with song and let me sing forevermore”. In other words, he brought the house down. It’s been a sad week, with the news of John Bunch’s death. John was a good friend to me, and, after meeting him at the Nairn Jazz Festival of 2002 (we were staying in the same Elgin hotel, and were transported to gigs in the same mini-bus), we stayed in touch between festivals – John, after all, was a dab hand at e-mail (and, even more impressively, at emailing photos). 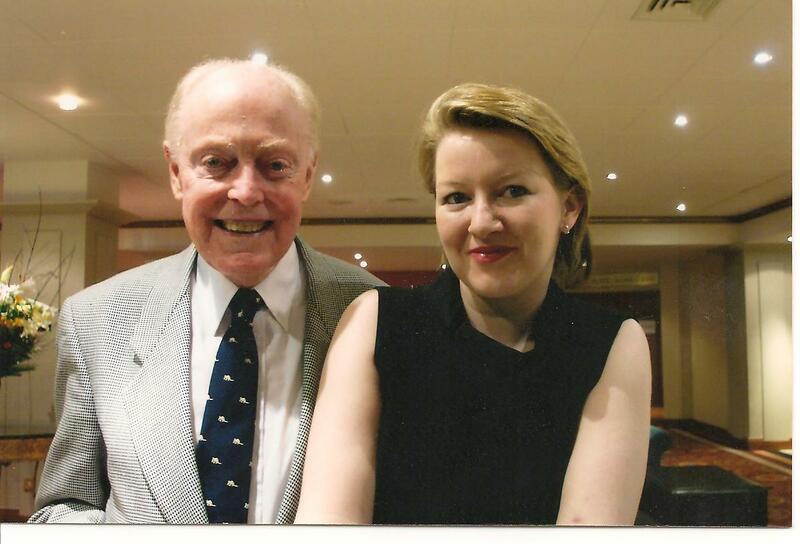 Scott Hamilton told me last week that John had been responsible for various jobs that he landed during his early days in New York – including his stint with the Benny Goodman band. And that there were lots of musicians who owed John a debt of gratitude. 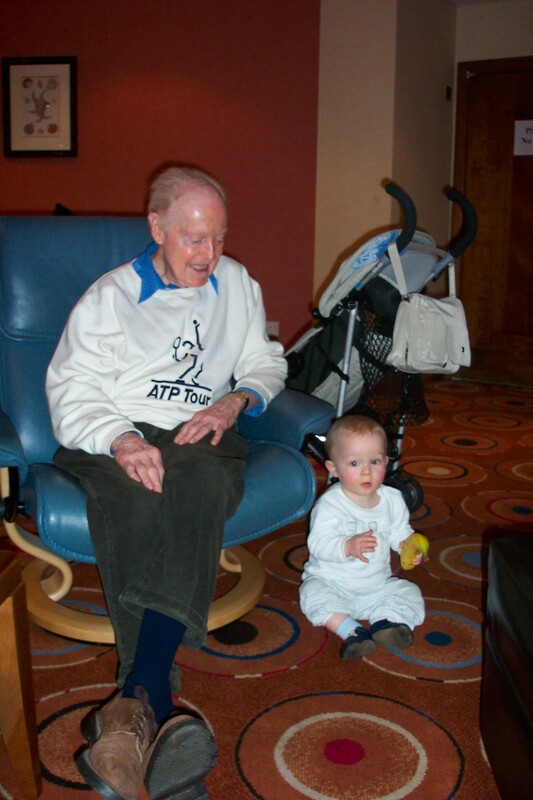 Helping and encouraging younger people seems to have been something that John did as a matter of course. He certainly did it with me, and would often send me emails congratulating me on articles that he must have sought out online. Just before I heard about John’s death, I finished the liner notes for Top Shelf, the new Arbors CD by cornettist Warren Vache and trombonist John Allred. It’s a reunion of the band that featured on the live CD, Jubilation, a couple of years back: in addition to John and Warren, there’s Tardo Hammer on piano, Nicki Parrott on bass and Leroy Williams on drums. Warren and John seem to have had great fun choosing the tunes – most of them lesser-played bop numbers from the 1950s and 1960s – and they play them in such a swinging and lyrical way that they’re very accessible even to those listeners who normally give bop a bodyswerve.. I sent the notes to Warren for approval just as the news of John’s death came through, and he immediately resolved to dedicate the CD to John, and to another friend and colleague who died recently, the great drummer Jake Hanna. A reunion at the 2008 Nairn Jazz Festival. John spent six years working as the musical director for the singer Tony Bennett so it was a strange coincidence that after several months on the blink, my digi-box finally sprang back into life in time for me to see Bennett in the star-studded documentary on Johnny Mercer, The Dream’s On Me, on BBC4 at the weekend. This hugely enjoyable and suitably long (after all Mercer did write more popular songs than just about anyone else) film was a real treat and featured performances by everyone from Bing Crosby to Jamie Cullum, via Morgan Eastwood. Who? I hear you asking. Well, if I tell you that Morgan Eastwood is the teenage daughter of the film’s executive producer, a certain Clint, that might explain it – and the fact she got to sing the programme’s title song! 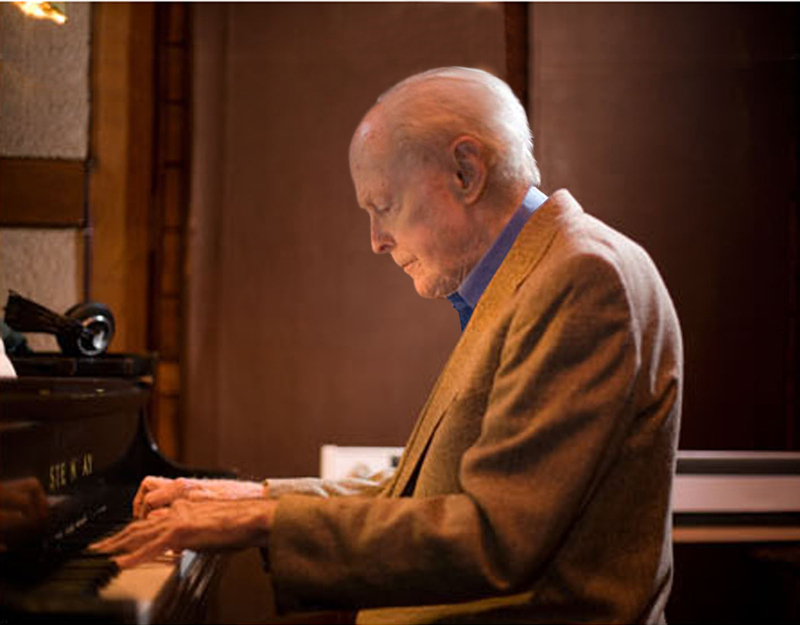 The death of the American jazz pianist John Bunch, at the age of 88, has triggered an outpouring of warmth from fellow musicians, festival organisers, promoters and the many friends and fans he made during his 38-year freelance career. He may have been in his late eighties, but Bunch – who had been battling melanoma, and only played his last gig a month ago – was still a vital part of the jazz scene, and remained young at heart right up to his death. Even as his health was deteriorating in the last few months, he was finding new ways to stay in touch with his younger friends – beating many of them on to such social networking sites as Facebook and Twitter. A quiet and thoughtful character who was known in the jazz world as “Gentleman John”, Bunch was renowned for his supremely tasteful and innately swinging style of playing as well as for his extremely modest and self-effacing personality. During a career which spanned over five decades, he was the first-call pianist for several generations of bandleaders, among them Benny Goodman, Woody Herman and Scott Hamilton whose career he helped to launch. 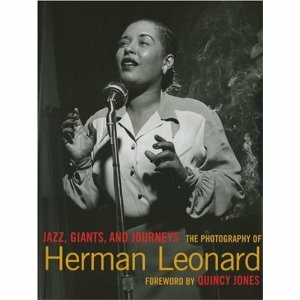 And in the late 1960s, he was hired by jazz-loving Tony Bennett to be his musical director and right-hand man. Born in the small Indiana town of Tipton in 1921, Bunch didn’t show any interest in music until a man he later described as “a wonderful piano player” moved into the area and began to teach children what was known as “popular piano” – the popular songs of the day. All the children took lessons but it was 11-year-old Bunch who emerged as the town’s top piano student. His teacher, who played in jazz bands and was very influenced by the great Fats Waller, asked Bunch’s mother if he could take him along to his gigs – and soon Bunch was sitting in with professional players. Bunch’s mother initially rented a piano for him to practise on, and when his talent began to shine through, one was bought – though this being the Depression, it involved a great deal of sacrifice. His parents split up around this time, and his mother took a job as cook in a restaurant, which was one of the first places to have a jukebox. The man who came to service it loved jazz and, having heard about the teenage Bunch’s talent, asked Mrs Bunch if he could take John to Indianapolis to hear the Count Basie band. After leaving school, Bunch played piano locally and worked in a factory before serving in the Second World War as a bombardier in the 91st Bomb Group, flying B-17s – “Flying Fortresses” – over Germany. On their 17th mission, they were shot down over Germany and two of the crew were killed. Bunch was the only one to emerge without any injuries, despite having had to bail out. He and his crew were taken prisoner and held in Stalag Luft 13, a camp for captured airmen. He later said: “I couldn’t believe it. They had a band, and I became its piano player.” It was for this band that he wrote his first arrangement. Bunch’s propensity for survival didn’t just extend to emerging physically unscathed from a burning plane; he also survived the infamous “death march” from his camp to another, in January 1945. After the war, Bunch took advantage of the GI bill for veterans to get a free college education. He studied speech rather than music because his sight-reading skills weren’t up to scratch, and he chose the University of Indiana because it had a band. Bunch worked with the Woody Herman band in Los Angeles before settling in New York in the late 1950s. There, he played occasionally with saxophonists Zoot Sims and Al Cohn and, as he put it, “lucked out” by landing a job in the last full-time band that “King of Swing” Benny Goodman led. Indeed, Bunch helped Goodman put together the band for the historic, government-sponsored, tour of Russia in 1962. During this tour, he became good friends with his hero, fellow pianist Teddy Wilson whom he had “idolised” when he was growing up. Bunch’s only stint in a full-time, non-freelance job was as Tony Bennett’s musical director between 1966 and 1972. While he enjoyed the challenges of the role, he missed jazz and took to organising jam sessions in his apartment to work off the frustration of having to turn down gigs. By the time he stopped working for Bennett, the jazz scene was picking up, thanks to the influx of such younger musicians as Scott Hamilton, who remembers how in-demand Bunch was. Bunch is survived by his second wife, Chips Gemmell. * John Bunch, pianist, born December 1, 1921; died March 30, 2010.